Let’s begin with a cliché today: every cloud has a silver lining. This summer has been unusually hot and sticky. Although we’ve had a lot of fun, we have had bouts of crankiness. We place the blame squarely on the weather (and our lack of air conditioning). That’s the cloud part of the cliche. Now for the silver lining: All that heat and humidity (and rain) are like steroids for our garden. I’ve made three batches of pesto already, and the basil’s still nearly knee-high again. The pepper plants are groaning with fruit, which are actually turning red this year. I can’t keep up with the tomatoes, although Libby helps; she loves to pluck still-green cherry tomatoes and roll them around the deck. Farmer’s market corn is just simply fabulous this year. We’ve been stopping by Turner’s Fresh Market as often as we can, to stock up. We buy a dozen ears, cook it all, and eat what we want the same day. The rest we cut off the cobs and freeze, since it holds up well that way. Even though Libby’s absconded with her share of cherry tomatoes, I still had an ever-expanding pile of them this weekend. They seem to be more acidic than usual this year, so I mixed them with corn kernels and diced bell pepper (homegrown!) for some natural sweetness. A splash of olive oil, a some of that overgrown basil, a pinch of salt, and we’re done. You could use cilantro instead of basil, but — please don’t hate me — none of us likes cilantro. 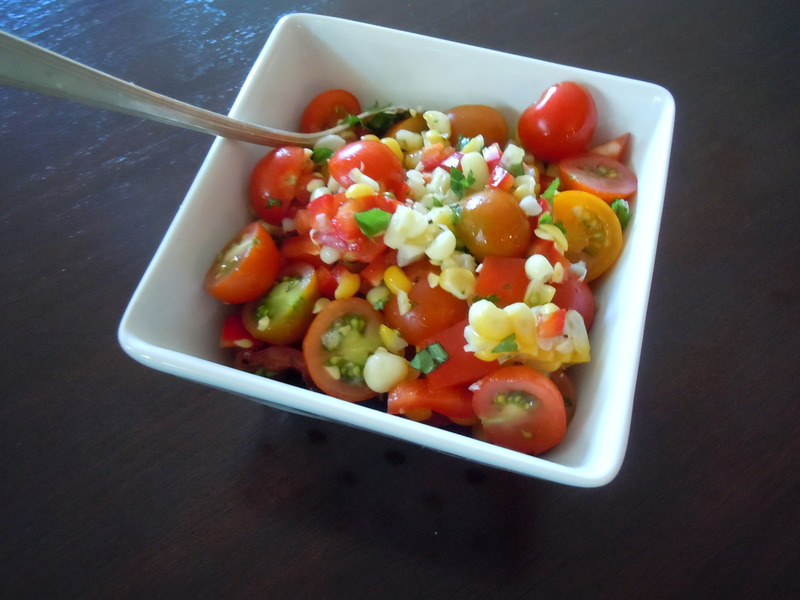 With the golden corn, ruby-red tomatoes and emerald basil, this salsa could win a prize for looks alone, but that beauty also translates into bright, fresh flavor. We served it alongside grilled chicken last night. The leftovers went into an omelet with some feta. (Queso fresco or a sharp white cheddar would also be fantastic.) Healthy, pretty, and very satisfying. Steam or grill the ear of corn until barely cooked. Let it cool a bit so you don’t burn your fingers, then cut off the kernels. Combine all the ingredients, stir gently to mix, and give it a taste. Adjust the flavor with salt, pepper, or lime or lemon juice to taste. It’s yummy right away, and better if you let it sit for a few hours. Adjust the proportions of corn and tomato to your liking. Leave the chile out if you don’t want heat; add garlic if you wish. Melt the butter over medium heat in a large skillet. Whisk the eggs together in a small bowl. Pour them into the hot skillet. 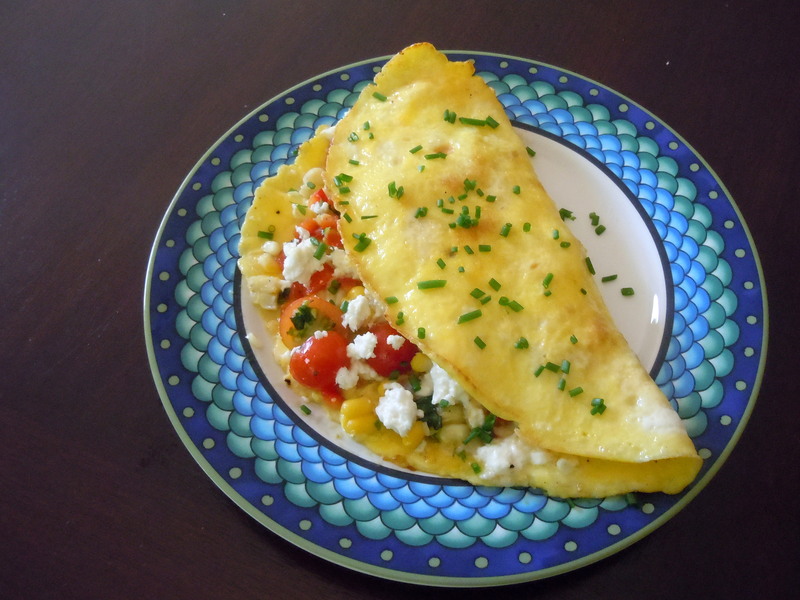 After a minute, when the bottom is cooked but still runny, spread the salsa and feta on one half of the eggs. Season with salt and pepper and fold the plain half of the omelet over the filling. Cook for 1 minute longer, just to finish cooking the eggs and melt the cheese a bit. Carefully transfer to a plate and serve immediately. This entry was posted in main courses, veggies and tagged avocado, cheese, corn, eggs, feta, tomatoes. Bookmark the permalink.